For other uses, see Fermentation (disambiguation). Fin progress: Bubbles of CO2 form a froth on top of the fermentation mixture. Overview of ethanol fermentation. One glucose molecule breaks down into two pyruvate molecules (1). The energy from this exothermic reaction is used to bind inorganic phosphates to ATP and convert NAD+ to NADH. The two pyruvates are then broken down into two acetaldehyde molecules and give off two CO2 molecules as a waste product (2). 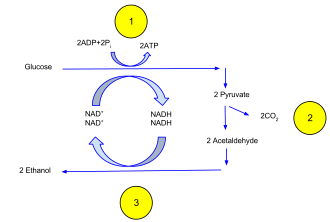 The acetaldehyde is then reduced into ethanol using the energy and hydrogen from NADH; in this process the NADH is oxidized into NAD+ so that the cycle may repeat (3). Fermentation takes place when the electron transport chain is unusable (often due to lack of a final electron receptor, such as oxygen). In this case it becomes the cell's primary means of ATP (energy) production. It turns NADH and pyruvate produced in glycolysis into NAD+ and an organic molecule (which varies depending on the type of fermentation; see examples below). In the presence of O2, NADH and pyruvate are used to generate ATP in respiration. This is called oxidative phosphorylation, and it generates much more ATP than glycolysis alone. For that reason, cells generally benefit from avoiding fermentation when oxygen is available, the exception being obligate anaerobes which cannot tolerate oxygen. In oxidative phosphorylation the energy for ATP formation is derived from an electrochemical proton gradient generated across the inner mitochondrial membrane (or, in the case of bacteria, the plasma membrane) via the electron transport chain. Glycolysis has substrate-level phosphorylation (ATP generated directly at the point of reaction). Humans have used fermentation to produce drinks and beverages since the Neolithic age. For example, fermentation is used for preservation in a process that produces lactic acid as found in such sour foods as pickled cucumbers, kimchi and yogurt (see fermentation in food processing), as well as for producing alcoholic beverages such as wine (see fermentation in winemaking) and beer. Fermentation can even occur within the stomachs of animals, such as humans. To many people, fermentation simply means the production of alcohol: grains and fruits are fermented to produce beer and wine. If a food soured, one might say it was 'off' or fermented. Here are some definitions of fermentation. They range from informal, general usage to more scientific definitions. Fermentation does not necessarily have to be carried out in an anaerobic environment. For example, even in the presence of abundant oxygen, yeast cells greatly prefer fermentation to aerobic respiration, as long as sugars are readily available for consumption (a phenomenon known as the Crabtree effect). The antibiotic activity of hops also inhibits aerobic metabolism in yeast . heterolactic fermentation is the production of lactic acid as well as other acids and alcohols. Sugars are the most common substrate of fermentation, and typical examples of fermentation products are ethanol, lactic acid, carbon dioxide, and hydrogen gas (H2). However, more exotic compounds can be produced by fermentation, such as butyric acid and acetone. Yeast carries out fermentation in the production of ethanol in beers, wines, and other alcoholic drinks, along with the production of large quantities of carbon dioxide. Fermentation occurs in mammalian muscle during periods of intense exercise where oxygen supply becomes limited, resulting in the creation of lactic acid. 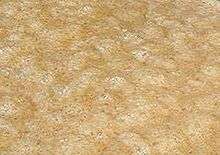 Fermentation products contain chemical energy (they are not fully oxidized), but are considered waste products, since they cannot be metabolized further without the use of oxygen. C2H5OH is the chemical formula for ethanol. Before fermentation takes place, one glucose molecule is broken down into two pyruvate molecules. This is known as glycolysis. The acidity of lactic acid impedes biological processes; this can be beneficial to the fermenting organism as it drives out competitors that are unadapted to the acidity; as a result, the food will have a longer shelf life (part of the reason foods are purposely fermented in the first place); however, beyond a certain point, the acidity starts affecting the organism that produces it. The high concentration of lactic acid (the final product of fermentation) drives the equilibrium backwards (Le Chatelier's principle), decreasing the rate at which fermentation can occur, and slowing down growth. Ethanol, into which lactic acid can be easily converted, is volatile and will readily escape, allowing the reaction to proceed easily. CO2 is also produced, but it is only weakly acidic, and even more volatile than ethanol. Acetic acid (another conversion product) is acidic, and not as volatile as ethanol; however, in the presence of limited oxygen, its creation from lactic acid releases additional energy. It is a lighter molecule than lactic acid, that forms fewer hydrogen bonds with its surroundings (due to having fewer groups that can form such bonds), thus is more volatile and will also allow the reaction to move forward more quickly. If propionic acid, butyric acid, and longer monocarboxylic acids are produced (see mixed acid fermentation), the amount of acidity produced per glucose consumed will decrease, as with ethanol, allowing faster growth. In aerobic respiration, the pyruvate produced by glycolysis is oxidized completely, generating additional ATP and NADH in the citric acid cycle and by oxidative phosphorylation. However, this can occur only in the presence of oxygen. Oxygen is toxic to organisms that are obligate anaerobes, and is not required by facultative anaerobic organisms. In the absence of oxygen, one of the fermentation pathways occurs in order to regenerate NAD+; lactic acid fermentation is one of these pathways. Hydrogen gas is produced in many types of fermentation (mixed acid fermentation, butyric acid fermentation, caproate fermentation, butanol fermentation, glyoxylate fermentation), as a way to regenerate NAD+ from NADH. Electrons are transferred to ferredoxin, which in turn is oxidized by hydrogenase, producing H2. Hydrogen gas is a substrate for methanogens and sulfate reducers, which keep the concentration of hydrogen low and favor the production of such an energy-rich compound, but hydrogen gas at a fairly high concentration can nevertheless be formed, as in flatus. Glucose could theoretically be converted into just CO2 and H2, but the global reaction releases little energy. This disproportionation reaction is catalysed by methanogen archaea in their fermentative metabolism. One electron is transferred from the carbonyl function (e− donor) of the carboxylic group to the methyl group (e− acceptor) of acetic acid to respectively produce CO2 and methane gas. The use of fermentation, particularly for beverages, has existed since the Neolithic and has been documented dating from 7000–6600 BCE in Jiahu, China, 5000 BCE in India, Ayurveda mentions many Medicated Wines, 6000 BCE in Georgia, 3150 BCE in ancient Egypt, 3000 BCE in Babylon, 2000 BCE in pre-Hispanic Mexico, and 1500 BC in Sudan. Fermented foods have a religious significance in Judaism and Christianity. The Baltic god Rugutis was worshiped as the agent of fermentation. The first solid evidence of the living nature of yeast appeared between 1837 and 1838 when three publications appeared by C. Cagniard de la Tour, T. Swann, and F. Kuetzing, each of whom independently concluded as a result of microscopic investigations that yeast is a living organism that reproduces by budding. It is perhaps because wine, beer, and bread were each basic foods in Europe that most of the early studies on fermentation were done on yeasts, with which they were made. Soon, bacteria were also discovered; the term was first used in English in the late 1840s, but it did not come into general use until the 1870s, and then largely in connection with the new germ theory of disease. 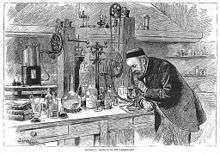 Louis Pasteur (1822–1895), during the 1850s and 1860s, showed that fermentation is initiated by living organisms in a series of investigations. In 1857, Pasteur showed that lactic acid fermentation is caused by living organisms. In 1860, he demonstrated that bacteria cause souring in milk, a process formerly thought to be merely a chemical change, and his work in identifying the role of microorganisms in food spoilage led to the process of pasteurization. In 1877, working to improve the French brewing industry, Pasteur published his famous paper on fermentation, "Etudes sur la Bière", which was translated into English in 1879 as "Studies on fermentation". He defined fermentation (incorrectly) as "Life without air", but correctly showed that specific types of microorganisms cause specific types of fermentations and specific end-products. Although showing fermentation to be the result of the action of living microorganisms was a breakthrough, it did not explain the basic nature of the fermentation process, or prove that it is caused by the microorganisms that appear to be always present. Many scientists, including Pasteur, had unsuccessfully attempted to extract the fermentation enzyme from yeast. Success came in 1897 when the German chemist Eduard Buechner ground up yeast, extracted a juice from them, then found to his amazement that this "dead" liquid would ferment a sugar solution, forming carbon dioxide and alcohol much like living yeasts. Buechner's results are considered to mark the birth of biochemistry. The "unorganized ferments" behaved just like the organized ones. From that time on, the term enzyme came to be applied to all ferments. It was then understood that fermentation is caused by enzymes that are produced by microorganisms. In 1907, Buechner won the Nobel Prize in chemistry for his work. Advances in microbiology and fermentation technology have continued steadily up until the present. For example, in the late 1970s, it was discovered that microorganisms could be mutated with physical and chemical treatments to be higher-yielding, faster-growing, tolerant of less oxygen, and able to use a more concentrated medium. Strain selection and hybridization developed as well, affecting most modern food fermentations. Other approaches to advancing the fermentation industry has been done by companies such as BioTork, a biotechnology company that naturally evolves microorganisms to improve fermentation processes. This approach differs from the more popular genetic modification, which has become the current industry standard. The word "ferment" is derived from the Latin verb fervere, which means to boil. It is thought to have been first used in the late 14th century in alchemy, but only in a broad sense. It was not used in the modern scientific sense until around 1600. 1 2 Klein, Donald W.; Lansing M.; Harley, John (2006). Microbiology (6th ed.). New York: McGraw-Hill. ISBN 978-0-07-255678-0. ↑ Tortora, Gerard J.; Funke, Berdell R.; Case, Christine L. (2010). "5". Microbiology An Introduction (10 ed.). San Francisco, CA 94111, USA: Pearson Benjamin Cummings. p. 135. ISBN 978-0-321-58202-7. ↑ Dickinson, J. R. (1999). "Carbon metabolism". In J. R. Dickinson; M. Schweizer. The metabolism and molecular physiology of Saccharomyces cerevisiae. Philadelphia, PA: Taylor & Francis. ISBN 978-0-7484-0731-6. ↑ Voet, Donald; Voet, Judith G. (1995). Biochemistry (2nd ed.). New York, NY: John Wiley & Sons. ISBN 978-0-471-58651-7. ↑ Stryer, Lubert (1995). Biochemistry (fourth ed.). New York - Basingstoke: W. H. Freeman and Company. ISBN 978-0716720096. ↑ Madigan, Michael T.; Martinko, John M.; Parker, Jack (1996). Brock biology of microorganisms (8th ed.). Prentice Hall. ISBN 978-0-13-520875-5. ↑ Thauer, R.K.; Jungermann, K.; Decker, K. (1977). "Energy conservation in chemotrophic anaerobic bacteria". Bacteriological Reviews. 41 (1): 100–80. ISSN 0005-3678. PMC 413997 . PMID 860983. ↑ Ferry, J.G. (1992). "Methane from acetate". Journal of Bacteriology. 174 (17): 5489–5495. PMC 206491 . PMID 1512186. Retrieved 2011-11-05. ↑ Vogels, G.D.; Keltjens J.T. ; Van Der Drift C. (1988). "Biochemistry of methane production". In Zehnder A.J.B. Biology of anaerobic microorganisms. New York: Wiley. pp. 707–770. ↑ McGovern, P. E.; Zhang, J.; Tang, J.; Zhang, Z.; Hall, G. R.; Moreau, R. A.; Nunez, A.; Butrym, E. D.; Richards, M. P.; Wang, C. -S.; Cheng, G.; Zhao, Z.; Wang, C. (2004). "Fermented beverages of pre- and proto-historic China". Proceedings of the National Academy of Sciences. 101 (51): 17593–17598. doi:10.1073/pnas.0407921102. PMC 539767 . PMID 15590771. ↑ Vouillamoz, J. F.; McGovern, P. E.; Ergul, A.; Söylemezoğlu, G. K.; Tevzadze, G.; Meredith, C. P.; Grando, M. S. (2006). "Genetic characterization and relationships of traditional grape cultivars from Transcaucasia and Anatolia". Plant Genetic Resources: characterization and utilization. 4 (2): 144. doi:10.1079/PGR2006114. ↑ Cavalieri, D; McGovern P.E. ; Hartl D.L. ; Mortimer R.; Polsinelli M. (2003). "Evidence for S. cerevisiae fermentation in ancient wine" (PDF). Journal of Molecular Evolution. 57 Suppl 1: S226–32. doi:10.1007/s00239-003-0031-2. PMID 15008419. 15008419. Archived from the original (PDF) on December 9, 2006. Retrieved 2007-01-28. 1 2 "Fermented fruits and vegetables. A global perspective". FAO Agricultural Services Bulletins - 134. Archived from the original on January 19, 2007. Retrieved 2007-01-28. ↑ "Gintaras Beresneviius. M. Strijkovskio Kronikos" lietuvi diev sraas". spauda.lt. ↑ Rūgutis. Mitologijos enciklopedija, 2 tomas. Vilnius. Vaga. 1999. 293 p.
1 2 Modern History Sourcebook: Louis Pasteur (1822–1895): Physiological theory of fermentation, 1879. Translated by F. Faulkner, D.C. Robb. ↑ The enigma of ferment: from the philosopher's stone to the first biochemical Nobel prize. Lagerkvist, Ulf. World Scientific Publishers. 2005. ISBN 978-981-256-421-4. p. 7. ↑ A treasury of world science, Volume 1962, Part 1. Runes, Dagobert David. Philosophical Library Publishers. 1962. p. 109. ↑ Wang, H. L.; Swain, E. W.; Hesseltine, C. W. (1980). "Phytase of molds used in oriental food fermentation". Journal of Food Science. 45 (5): 1262. doi:10.1111/j.1365-2621.1980.tb06534.x. Wikimedia Commons has media related to Fermentation. Works of Louis Pasteur Pasteur Brewing.